Female-driven design! Lustre is a collaboration between British designer Bethan Gray and Emily Johnson, Co-Founder of ceramics brand 1882 Ltd. 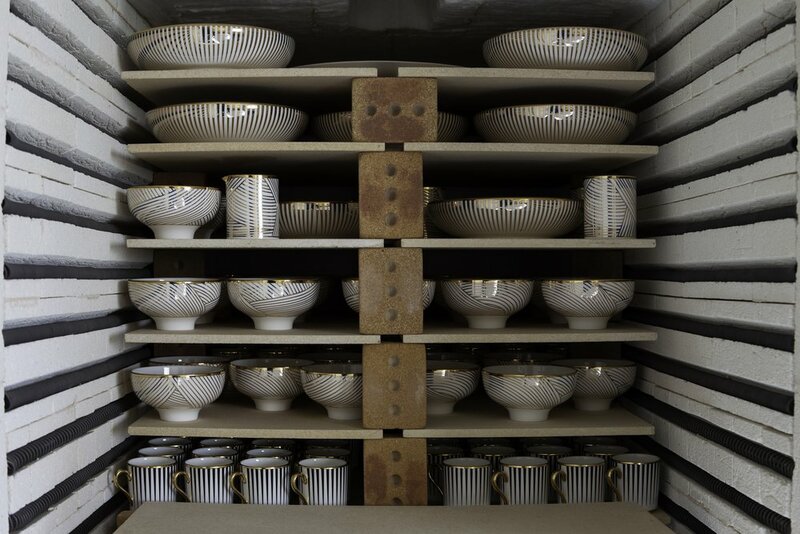 The result is a collection of 24-carat gold, fine bone china tableware, which includes bowls, plates and mugs. A series of chance meetings led Bethan and Emily to collaborate - their paths frequently crossed at design shows all over the world. Not only did they get on famously (essential to a good working relationship), they also shared similar values: nurturing industrial craft, and working closely with artisans and makers. Like all of 1882 Ltd’s collections, Lustre highlights the industrial crafts of Stoke-on-Trent, only this time pushed to a new level of complexity and skill under Bethan’s influence. The collection is made from fine bone china and 24-carat gold, both of which have a shine that is difficult to replicate with other materials. Applying the pattern to the china is complex, given the curvature, and can only be achieved by carefully hand-applying many individual decals. The entire casting, decorating and firing process takes 12 days from start to finish. Lustre comprises two bowls, two dinner plates, a salad plate, coffee cups, espresso cups, a jug, a sugar bowl, a tea light and a platter, and will launch at designjunction 20-23 September 2018.